The inventor of the incandescent electric light bulb was born at Pallion Hall*, Sunderland, on 31st October 1828. Leaving school at twelve, he was apprenticed to a firm of local chemists, before moving onto a similar firm run by John Mawson, in Newcastle. In time, Swan would develop many new processes in the burgeoning photography business – patenting the carbon process for photographic printing in 1864, and inventing the dry plate (1871) and bromide paper (1879). Swan was an enthusiastic member of the Newcastle Literary & Philosophical Society (which still exists), and became hooked on the search for a practical electric light bulb after witnessing an early demonstration in which a wire was made to glow after being placed across a battery. Early models by Swan and others were pretty useless affairs, but our man persevered with wires of many different materials – eventually falling upon specially coated carbonised paper, of all things. But only when there was no oxygen present would the filaments hold firm – and try as he might, he couldn’t get a completely ‘clean’ oxygen-free vacuum. In the end – and after more than a quarter of a century of trying – he had to essentially invent the world’s first artificial fibre (a sort of rayon, or artificial silk), which would then be carbonised, placed in an oxygen-free tube, then heated. By the late 1870s he was at last able to get his special filaments to glow white without burning out. After showing a few friends, he then demonstrated his process to a packed Lit & Phil Society lecture theatre in Newcastle on 3rd February 1879, and the world would never be the same again. Swan didn’t bother properly patenting the carbon-filament making process, and so allowed Thomas Edison to steal a good deal of his thunder over the coming months and years as the American tried to claim the credit, quite wrongly, for the new invention. 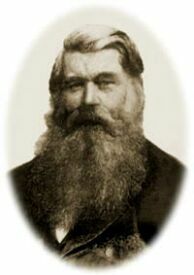 A dispute arose between the two of them during 1879, which exploded when Swan opened his light-bulb factory in Benwell, Newcastle, in 1881. Eventually, however, they buried their differences (or rather their similarities!) and joined forces with the ‘Edison & Swan United Electric Light Co.’ in 1883. Swan’s home at the time, Underhill in Gateshead, was the first private home to be lit by electric lighting. Most of Swan’s experiments were conducted in the property’s greenhouse - and Underhill still stands in Kells Lane to this day. The great man was elected a Fellow of the Royal Society in 1894, knighted in 1904 and died in Warlingham, Surrey, in 1914. * Pallion Hall was demolished in 1901. It used to sit a little to the north of the present-day Pallion Metro Station, not far from the River Wear.